Like the original game, the goal of Labyrinth 2 is to get the silver ball from the starting point to the goal while navigating walls and avoiding the holes. In the first version, that was pretty much all there was to it. 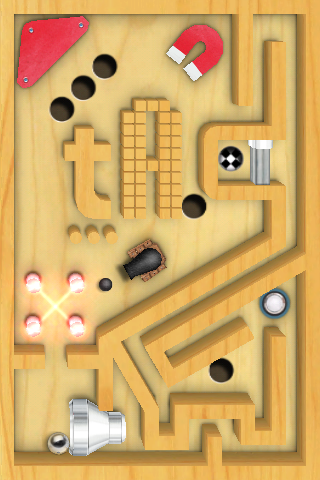 Labyrinth 2, however, adds a number of new elements that graduate the game from simple wooden toy simulator to arcade game. These elements include cannons, bumpers, doors/switches, magnets, fans, resizers, merry-go-round, duplicators, lasers and more. Navigating the levels still require careful tilt control to avoid falling to your death, but are also more puzzle/goal driven as you must also figure out how to make it to the exit. Levels are timed as before so beating your individual high scores remains the motivator to play a level again. This time, however, they’ve added a ghost ball representation of your best time for you to directly compete against. The creativity so far has been astounding, and now that the game is out in the wild I can’t wait to see what the player base comes up with. If you’ve enjoyed labyrinth games in the past, Labyrinth 2 is a must-own. If you want to sample some of the great things in Labyrinth 2, as we posted previously, you can play 5 levels from the sequel in the recently updated original Labyrinth [$2.99] and Labyrinth Lite [Free].